This is a new book on the Operation Dynamo, which was the largest retreat operation done by Allies during World War 2. This battle is becoming more popular nowadays because of the next coming film entitled “Dunkirk”. This is a 2017 English-language war film written, co-produced and directed by Christopher Nolan. 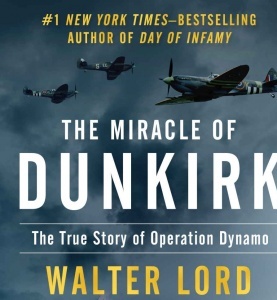 In this book, Walter Lord is inspired by interviews with hundreds of survivors to write The Miracle of Dunkirk. This is a striking history of a week when the outcome of World War II hung in the balance (Arthur Schlesinger Jr.).